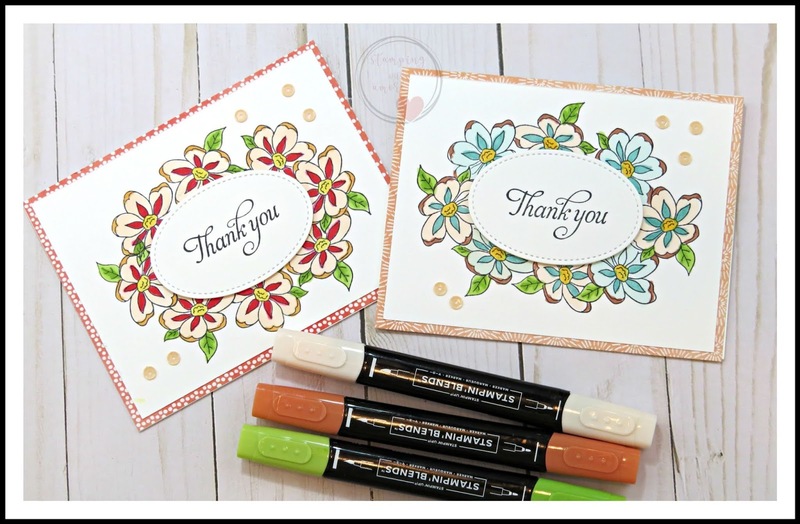 Today is simple stamping for beginner's day, however I'm sharing the April Paper Pumpkin Kit and a couple Alternative projects. The Paper Pumpkin Kit is perfect for the Beginner stamper, because they can test out stamping at a minimal cost to them since everything is included in the kit, except maybe some snips. I absolutely love this kit. How beautiful is that large Flower on the acetate box? Every card in this kit is so pretty. Next month you have the opportunity to Subscribe to The May Paper Pumpkin kit that was designed by Shelli Garner, Stampin'up Ceo. Her style is absolutely my style! Love this kit. SUBSCRIBE HERE BY MAY 10 to get this Special Kit!! Happy Tuesday! Today's technique is the masking technique and I'm using it to create a background for my Sentiment. It's a technique I used to be afraid of, but the more I do it, the more fun it's become. It's one you should really try. I suggest using the larger stitched oval for the template and then the smaller stitched oval for the sentiment. You can really create some pretty backgrounds for your sentiments, just use your imagination and create with different stamp sets and colors. Thank You my sweet friends! 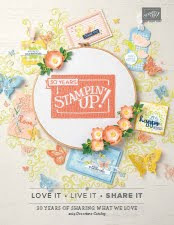 Don't forget there are a bunch of Stampin'up products retiring and if there is something you are wanted before it retires grab it quick. 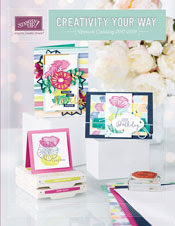 Stampin'up is getting ready for all the New stuff coming this June in our New Catalog. 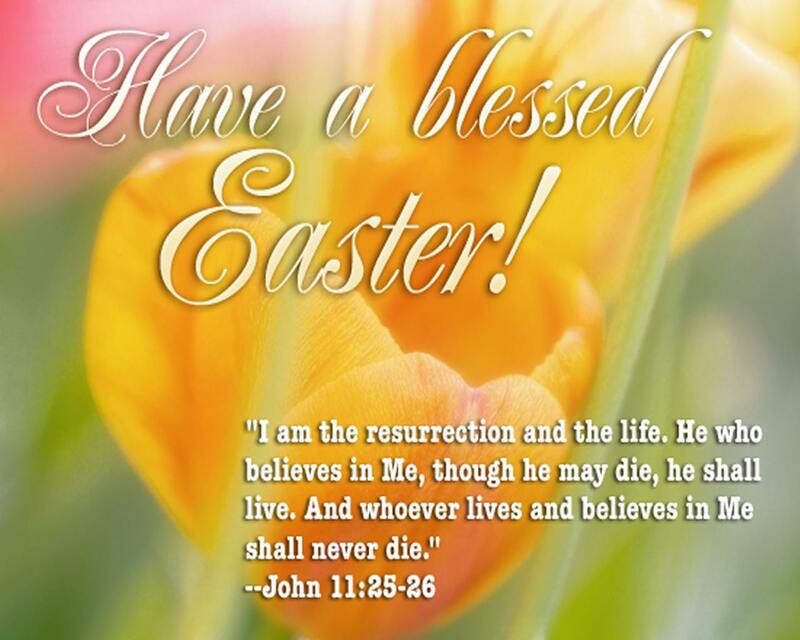 HAPPY EASTER TO ALL MY FRIENDS, FROM MY FAMILY TO YOURS! I'm sharing today the swap I made for Onstage. This box will fit 2 or 3 Ghirardelli squares. I'm going to miss this designer series paper. If you are interested in still getting it, check out the retiring list below. If anything on the retiring list is on your wish list, get as soon as possible, because they always go fast. I stocked up and will definitely still use this gingham dsp. Hope you enjoy the tutorial! These are four of the five colors, just the Balmy Blue is missing. 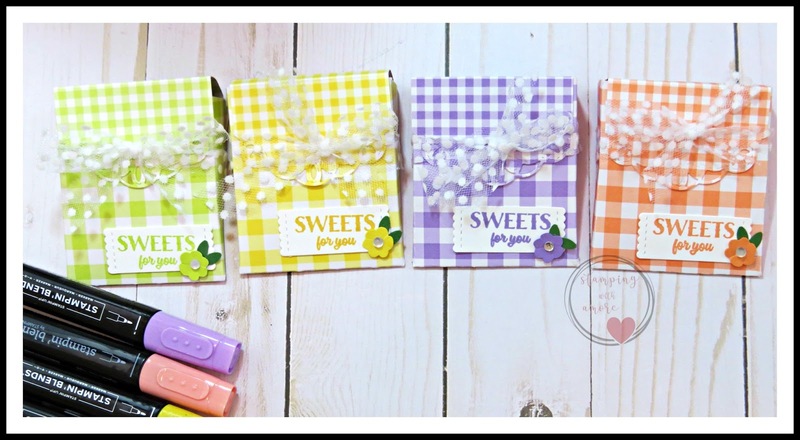 Also the Sweetest Things stamp set is retiring, But I'm so happy the Stitched Label Framelits are carrying over. I've used these a ton in my 3 d projects. Once again, I will no longer be sharing a PDF on my Blog. I needed to rethink some things in my Business, and because Pdf's can be so time consuming, I decided since I put all the measurements in the video, I'm just doing double duty . If you ever have any questions about a project you can send me a email or message me. HAVE A HAPPY EASTER MY SWEET FRIENDS! I'm sharing my last Facebook Live here with you today. It's a Mother's Day Gift Box, this can be also for some treats or a small gift. Again, some of these items are going away, If you want to get some of them before they retire, SHOP HERE! Things go fast this time of year so get your orders in asap. Especially if you need reinkers for the In colors going away. One of these is Night of Navy and one is Call me Clover, both coordinate with the Happiness Blooms designer series paper. I'm also using the Tea Together stamp set, which is carrying over into the new catalog! Yeah! Thank you very much for stopping by today, I hope you come join me for my Facebook Live's on Thursday's at 6:30 pm central time. Sometime's I don't post them to my Blog, so you may miss out on some 3 d projects. This is the Simple Stamping For Beginners Series Card. 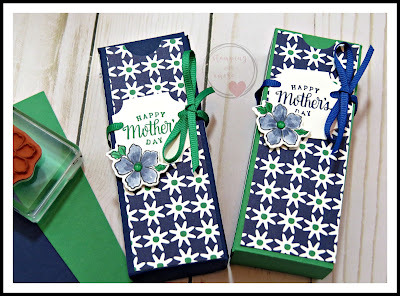 This card does not have a stepped up version, but by adding a ribbon, a scalloped mat for the image or some embellishments would really step it up. We got some good news at Onstage that we are going to come out with a mini brochure for Beginner Stampers. I'm so excited about this because it will make it so easy for the beginner stamper to order some smaller stamp sets and make it much simpler to pick what you need, not overwhelmed by a large catalog. I really wanted to use this little Bird again. He is so sweet! 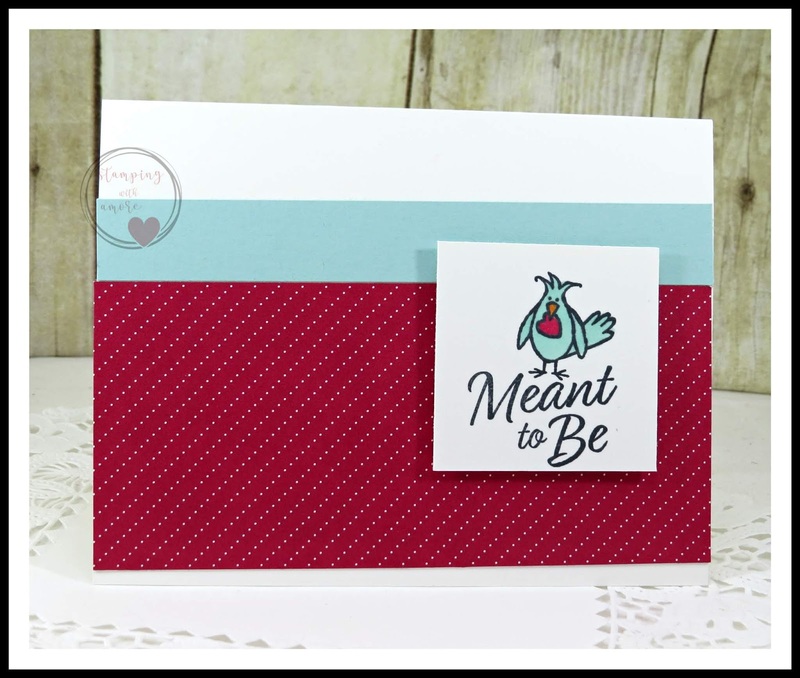 The Meant To Be Stamp set is carrying over to the New Catalog, however the Hey Love stamp set is not. Check out the Retiring List and Get it before it's gone, it's so cute. For my Beginners, I will post the measurements here on my Blog to make it a bit simpler for you. Card Base: 5 1/2" x 4 1/4". Red All My Love designer series paper 5 1/2" x 2 1/2". Pool Party 5 1/2" x 3/4". Whisper White for stamping Image 2" x 2". WHAT! A Friend Slider Treat Box?